Coastal landforms are created by a wide variety of coastal processes, which vary depending on the process, the wave climate, beach morphology, geology, and human activity. This results in the two umbrella processes of erosion and accretion. Erosion is defined as “the group of processes whereby debris or rock material is loosened or dissolved” (Thomas & Goudie, 2000), whilst accretion is “the gradual increase in the area of land as a result of sedimentation” (Thomas & Goudie, 2000). Both processes cover a number of sub-processes, some of which cause both erosion and accretion. Abrasion occurs when windblown sand or water-borne shingle is thrown against cliffs. It is probably the most effective form of erosion on rocky shores. Waves can cause abrasion on their own, but only on soft formations such as clay and shale. Attrition is the process of breaking down material lost from cliffs and rocky shores by abrasion. 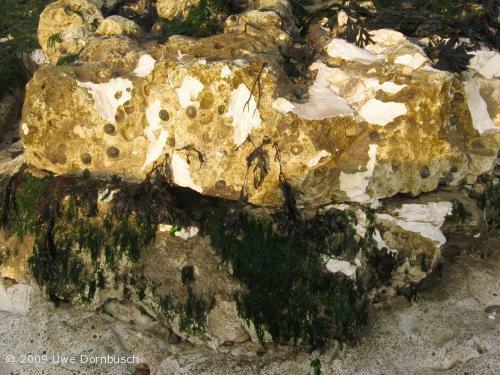 Corrosion / solution mainly takes place on limestone cliffs, such as those around Dover or Beachy Head, when the acidic sea water dissolves the chalk. It can also occur by the evaporation of salt, forming crystals that expand and cause the rock to disintegrate. Hydraulic pressure occurs when a pocket of air is trapped and compressed in a joint in a cliff or between a wave and a cliff. Over time this weakens the rock and causes it to break off. Weathering can either be wetting and drying or freeze-thaw. The former is more common in coastal areas, and is the result of the repeated and wetting and drying from sea spray weakening the rock, and is related to corrosion. Freeze-thaw (below) occurs in colder climates, where water in joints and cracks freezes and expands, shattering the rock. Bioerosion is caused both by marine organisms such as molluscs, marine worms, sponges and sea urchins, and coastal flora. Organisms cause erosion by drilling into or scraping grooves across shore platforms. Flora erodes rocks on both shore platforms and cliffs by forcing roots into cracks and shattering the rock. Scour is the result of waves acting on beaches, often around groynes or breakwaters, or along cliffs. Water is channeled by the structures, creating faster flows and increased erosion, especially on sandy beaches. 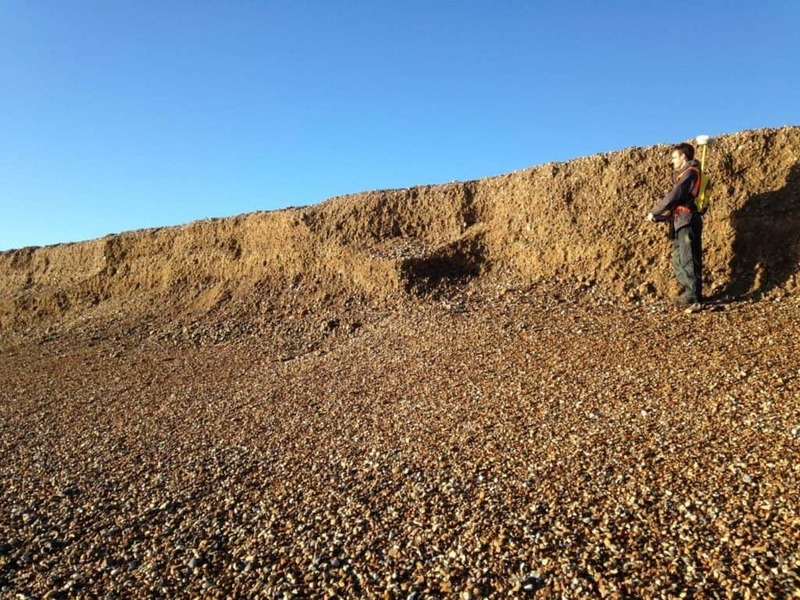 Cliffing is when a vertical drop on the beach resembling a cliff occurs due to beach erosion, usually on a mixed shingle sand beach. Longshore drift is the main method of transportation of beach material along the beach. The angle that waves approach the shore at is dependent on wind direction, the orientation of the coastline, and the degree of refraction. As waves do not (usually) approach the shore at right-angles, this leads to the creation of a longshore or littoral drift, which moves material downdrift. In addition, as waves approach the beach at an oblique angle, they break and the swash pushes material up the beach. However, the backwash is controlled by gravity, so material is then pulled down the beach at right-angles to the shore. Over time material moves along the shore in the dominant drift direction. A good example of this is the coastline between Beachy Head and Dungeness, where material moves in an easterly direction along the shoreline. Conversely, the coastline between Folkestone and Dungeness experiences a westerly movement of shingle, which creates the shingle headland at Dungeness. Thus, longshore drift causes both erosion and accretion. 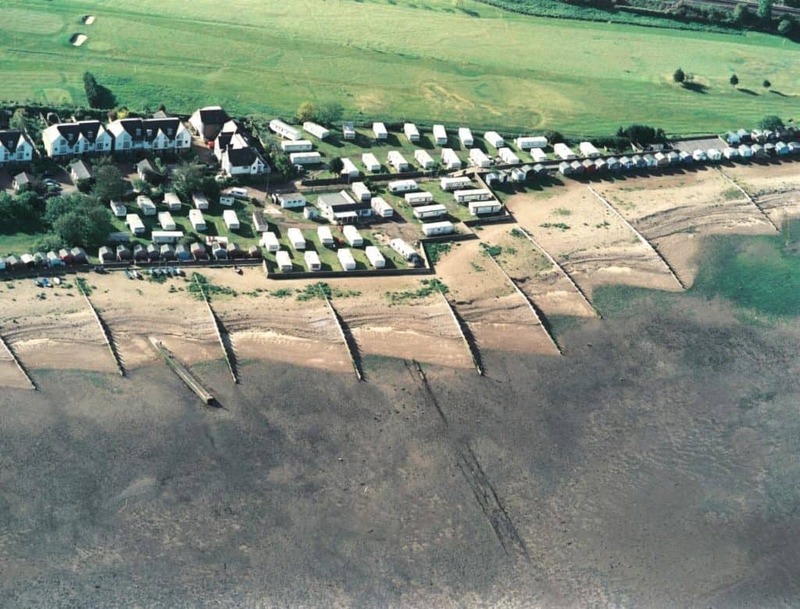 Bird, E. (2000), Coastal Geomorphology – An Introduction. John Wiley & Sons Limited, Chichester. Thomas, S. G., Goudie, A. (2000), The Dictionary of Physical Geography (3rd Edition). Blackwell Publishing, Oxford. Waugh, D. (2000), Geography – An Integrated Approach (3rd Edition). Nelson, Walton-on-Thames. Woodroffe, C.D. (2002), Coasts – Form, Process and Evolution. Cambridge University Press, Cambridge.